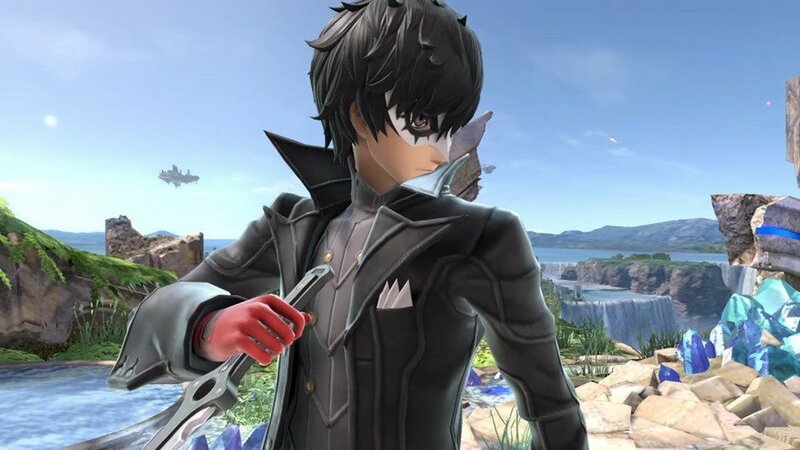 If you missed the news, Persona 5's Joker is making his way into Super Smash Bros. Ultimate on Nintendo Switch today. Frankly, we'd be amazed if you have missed the news because we've been prattling on about it all day (you can check out more Joker content at the bottom of this article) but now it's time to really get stuck into the good stuff. Joker's moveset. Joker's reveal trailer gave us our first look at the character in action, and we've been watching it very closely to see exactly how his moves work. So, let's get started. Neutral Special (Gun) - For his neutral special, Joker wields a gun. To shoot continuously, you can simply press and hold the 'B' button or repeatedly tap it, and you can also dodge forwards, backwards, or even in mid-air while shooting. Up Special (Grappling Hook) - The grappling hook shoots out at a slightly diagonal angle and can either be used to pull opponents in closer, or to latch on to the edge of a stage. Like many up specials, this one will be useful for recovery. Side Special (Eiha) - Eiha, Joker's side special, is triggered with a finger snap animation. The initial hit isn't particularly strong, but it inflicts more damage over time. Down Special (Rebel's Guard) - Now, this one is particularly fancy. Joker has a Rebellion Gauge which builds up over time, notably when he gets hit or is behind in terms of damage or stock. By using your down special, you can fill the gauge faster, and it can also be used as a defensive tool. Your Neutral Special becomes 'Gun Special', essentially handling the same as before but with the new ability to fire three bullets per shot. Up Special becomes 'Wings of Rebellion'. Using Arsene's wings, you'll swiftly move upwards, making you invincible as you fly. Again, this can be used for recovery purposes. Your Side Special becomes 'Eigaon', a large blast which repeatedly hits opponents, inflicting them with longer lasting damage. And finally, your Down Special will now perform one of two counter-attacks, each triggering automatically. Melee attacks will be countered with 'Tetrakarn', whereas projectiles will be deflected with 'Makarakarn'. There's one final thing to mention, of course, which is Joker's Final Smash. 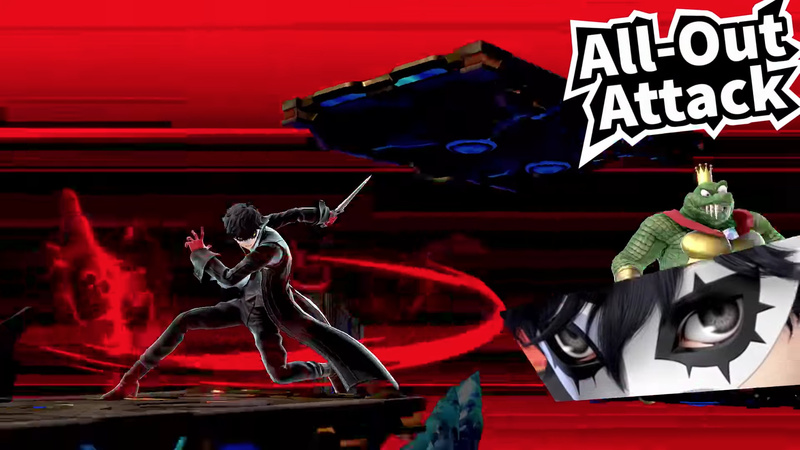 Called 'All-Out Attack', Joker's Final Smash sees him cutting through foes on the battlefield. Once he's done that, he'll launch a coordinated strike with the Phantom Thieves of Hearts. Interestingly, if you fail to make contact initially, you can have another swing at it by tilting your control stick in the opposite direction, giving you a second chance to land the final smash. It's worth noting that having Arsene by your side (achieved by filling your Rebellion Gauge) will not have any impact on Joker's Final Smash. So, there we have it. We hope you find this useful if you plan to use Joker in Super Smash Bros. Ultimate. Let us know if you're excited to get stuck in or, if you're reading this in the future, let us know how you've been getting on with the character with a comment below. Is it out yet ? Does somebody know when this will get out if it isn't yet ? @Xiarno I heard 8:50 PM PST. And this, even before the mere being an M-rated SEGA rep, makes Joker this game's Bayonetta equivalent. I don't think Joker's this broken... I wish I could find out, though, but the vague release date of "today-morrow" doesn't help. If all DLC characters will be out by February of next year, I hope we find out the other ones soon. I bet the next one will be revealed during Nintendo's E3 Direct. With that said I’m super excited for the release I can’t wait! I wish that cat thing would have been an assist trophy as well that would have been neat. @iRiS I wish we'd find out about two at E3! Joker is just Dante undercover. @Giygas_95 i'm curious about this myself. Though if the rumor of a dragon quest rep proves true, I suspect that will be next one based on the releases dates of Dragon Quest Builders 2 and Dragon Quest XI S alone considering that covers a stretch going from July(Builders 2) to early Fall(XI). And it might even fit with the idea we're getting a Persona fighter in Smash because if the rumors prove true of an upcoming Persona 5 switch port that might mean a trifecta of the Big Three of the jRPG tradition(FF Cloud/SMT Persona Joker/DQ Erdrick or Luminary) having both playable fighters in Smash AND playable games present on Switch. 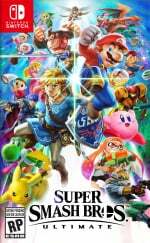 Since we already know the two biggest latest Dragon Quest releases are coming to Switch and westward while we already have a bucket load of remasters of the biggest non-MMO FF games of the from 7 to 12 with only VIII missing of the major non-MMOs titles... leaving only a playable Switch Persona game and Dragon Quest Smash Bros fighter to complete the trifecta of franchises. How am I supposed to learn about Joker's down tilt now, besides waiting until this evening? I'm ready! Well, except for the fact of how late it launches in my time zone. I heard 8:50 EST somewhere. I've seen a few contadicting sources and word of mouth. Does anyone know what the EST time is? His base form looks to have a gimpable recovery and he doesn't have much of a long range game (gun and eiha only tickle the in-your face opponents), sure he can persona but getting KO'ed will drop the persona meter. Try not to get him into persona by knocking him out quickly which won't be too much of a problem because of his recovery and use grabs so he won't rebel guard and you'll be okay. I'll have to see once I download him (I have enough gold points to get him for free), but on the surface he looks pretty darn overpowered. Have to wait and see his actual damage output among other things. @Magikarp_18 most players never use the final smash any way. Oké now I can't wait for the other DLC! So, let me do some. Maths. There are ten months till the set DLC deadline, and four fighters left. That’s about two and a a half months between each characters release. This would make sense as Piranha Plant came out at the end of January, about two and a half months ago. Now, this means the next fighter should come out at the end of June/early July. This means E3 is the latest feasible opportunity for an announcement. @2legit2quit @Dodger yeah, I mean these are the moves that generally have the most “flavor” but as I’ve gotten serious with the game, special moves became a sometimes thing. I was hoping for a FULL rundown. Ya know, I've complained numerous times about all of the sword welding modern lamewad Anime looking fighters most notably from the fire emblem series and how Sakurai ruined a few old school characters by anime-fying PIT and even making little mac look a little too realistic vs what the cartoonier old school look that was prevalent through out the 80s and early 90. Sigh. But now we have this guy, the Joker. Hands down the worst character to hit the roster this far. There are 3 more empty slots. Mike Jones(StarTropics), Bill rizer(contra) and Wart (super Mario Bros.2). Make it happen Nintendo! Feel like the characters are over elaborate now. If Mario were introduced as a new character now he'd be able to fly using the racoon suit and have random invincibility. And there are 4 more slots open, not 3. Oh, and just to nibble on this bait, none of your requested characters are getting in. Of course not, because young melinials like you keep requesting and voting for BS like the Joker. Ryu Hayabusa has the greatest chance out of the following I mentioned BTW. You spelled "millennials" wrong. And I didn't vote for Joker. I didn't even know who he was when the voting started. I agree that Ryu is the most probable in your list so I'll concede to that. But again, there are 4 more open slots, not 3. And these characters have already been chosen. @ShadJV Yeah, I main Pokemon Trainer, and there are only a few special moves amongst the three that are any good. Withdraw for Squirtle is a good punish for long attack animations, Ivysaur's vine whip and razor leaf are great attacks, Charizard's fly is one of a handful of Charizard moves that aren't awful. But PK Trainer has some really reliable non-special attacks. Squirtle's attacks are so fast that he can challenge a lot of slower characters into stupid combos. Ivysaur's up air and down air could be special moves in themselves, and she has great range on her other air attacks. And Charizard has a couple moves that don't take a thousand years to start up without actually packing a punch. So if you played PK Trainer with just special moves, you'd be missing out on most of what the character can do. That being said, I'm not actually expecting Nintendo life to spend an hour talking about every little thing Joker can do. I'll leave spending an hour talking about Joker's ledge options to GamExplain. Still need the Fighters Pass so I can get him. Pretty cool moveset IMO. @Wavey84 Worst character to hit the roster? Nah. That spot belongs to Mr. Game & Watch; he's practically useless! How so? He's easily one of my favorite characters to play as, plus he's the star of the OG 'game and watch' hand helds that were released in the early 80s. He's worthy where as Joker.....right. he's tailored for the younger generation. But yup, he's not even recognizable to me. Not familiar at all with the persona series other than hearing about its debut back on the PS2 unless I'm mistaken. @Wavey84 Every single Special move is easy to escape with Bowser's Up Special, his Final Smash is stupid ala Patrick Star and no one under 15 will even know who he is. He was a really dumb choice for Smash and I see no point in keeping him for future installments. Why am I even responding to this. There are mid 30 year Olds and onwards who actually still game. Mr game and watch was thrown in melee which came out in 2001 before you were probably even born. @Wavey84 Just stop. If you don't like Joker, don't ruin him for everyone else. Also, please learn better grammar skills; I cringe when people use the same level of grammar as you. Just saying. @Wavey84 Oh and one more thing: Most of the characters you mentioned in your first post have little to no chance of appearing as anything more than Spirits. Rock on child. Rock on. @Wavey84 Calling me a child is very immature. You are seriously close to being on my Ignore list.